Hi friends! Today I have two one layer cards featuring stamps from Concord & 9th. Both of these cards were created using just the card base, with no additional paper layers. 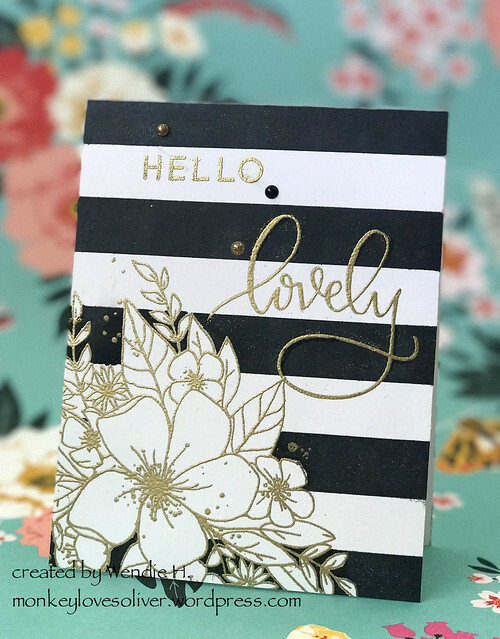 First up, I have a one layer card using the large floral stamp from Hello Lovely and the large background stripe stamp from Stripe Builder. First I stamped the floral stamp down in the corner, using Versamark ink, and then embossed with gold powder. Then I made a mask, which let me tell you, now I understand why they call it “fussy cutting”. With the mask in place, I stamped the stripes in black ink (Lawn Fawn). Where the stripes should have been behind the floral spray, but weren’t due to the mask, I filled in with a black brush marker, which thankfully matched the Lawn Fawn ink perfectly. Next, I stamped and embossed the sentiments in gold to match the floral spray. Finally I added a few enamel dots for embellishment. I’m entering this card into the latest Inspired by all the Little Things challenge. I was inspired by the striped rain coat, black & white scene, and the small pops of bright lights. Since I went to the trouble of cutting out that mask, I decided to make a second one layer card using the floral stamp from Hello Lovely. For this card, I stamped in the upper left corner, lay down the mask, and then stamped again in the upper right. I should note that I only partially inked the stamp the second time because I didn’t want the floral spray extending too far down the card. Pro tip: Make sure your stamp is completely dry after cleaning and before positioning in your stamp platform. I ended up with diluted grey ink smudging my card before I stamped the second time. To correct that, I smooshed some of that ink onto my craft mat, spritzed it, and flicked it over my card with a paintbrush. Happy accident. 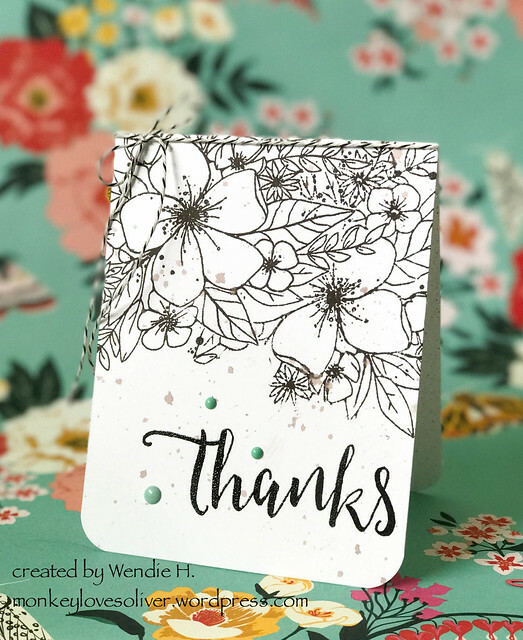 I finished the card with an embossed sentiment from the Give Thanks set, some black and white string, and some enamel dots that provide the only color on this card. I’m entering this card into the latest Where Creativity Meets C9 challenge, which is “one layer” cards. Update: I was the challenge winner at WCMC9! Thank you all so much for the wonderful comments! These are both gorgeous and amazing, Wendie! both cards are absolutely gorgeous!! and wow!!! you deserve a prize for your fussy cutting!!! Both your cards are just lovely, so elegant. 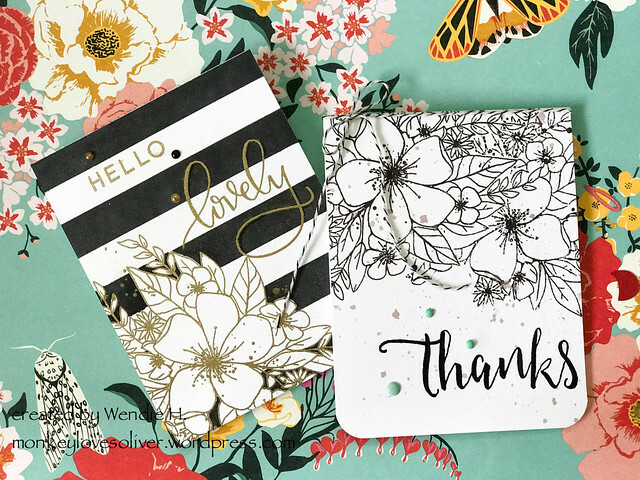 Wendie – your cards are really lovely – I’m just amazed at how you did the stripes! Thanks for joining our challenge this week at Inspired By All The Little Things! I love them both. Way to hang in there with fussy cutting 🙂 The masking gives a huge impact! Wendie you cards are spectacular! The gold embossing on the first one and masking is a great idea. Very eye-catching! Thanks for playing along with us at Inspired By! Wow…what beautiful cards! So elegant and pretty. Love the bold stripes and gold embossing on the first one. So happy you joined us in the Where Creativity Meets C9 one layer challenge. Woah, these are stunning! Just stunning! I love them both and such an awesome use of white, gold and black! Thank you so much for playing along with the Where Creativity Meets C9 Challenge! That mask was a labor of love, but it was absolutely worth it. Both of your projects are truly spectacular. WOW! Thanks so much for joining us over at Where Creativity Meets C9! Wow!!! These are both stunning! I’m amazed that they are single layers. Awesome job! Thanks so much for joining us at Where Creativity Meets C9! your win at Concord & 9th is so well deserved, Wendie – such a fantastic card – love both of them and will look forward to you GD spot!! !